The hankering to put an honest loaf on the table is something most amateur cooks feel at one time or another. But no one wants to go through hours of effort only to find an unleavened lump at the end of the process. I have had very little success in this regard, but this one recipe seems to work for me every time. 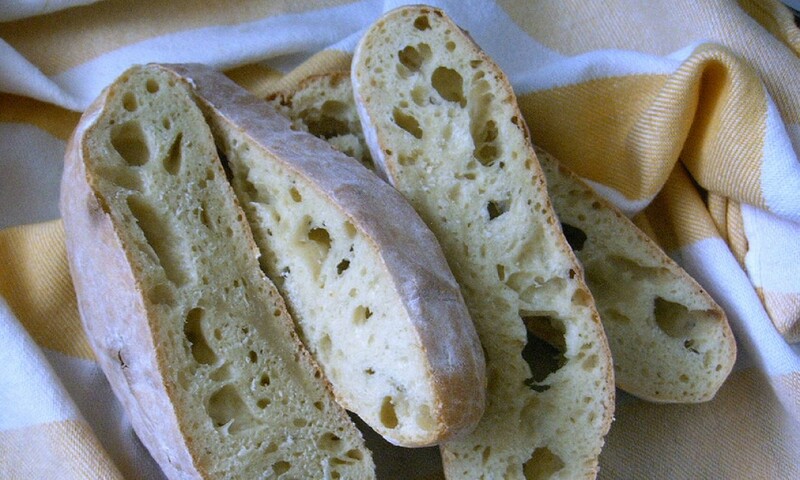 Many of the recipes for classic regional breads, such as this ciabatta recipe, begin with a starter dough made from small amounts of flour, water, and yeast allowed an initial fermentation. The starter, known as a biga, (pronounced Bee-ga) not only gives strength to the flours, it also produces a secondary fermentation from which comes the aroma, flavour, and special bounciness of the final loaf. Experiment each time with different quantities of the flours. Mix all the ingredients in the mixer at lowest speed for 2 minutes. The purpose is to create a light fermentation, not a strong gluten. Leave in a lightly oiled bowl, cover with clingfilm and leave at cool room temperature or in the refrigerator for at least 24 hours, or up to 72 for maximum flavour if you have the time and patience. Mix the biga and remaining ingredients in a mixer until all the flour is wet. Switch to the dough hook and knead for 2 minutes at low speed then 2 minutes at medium speed. The dough should be smooth and bouncy. I feed in the water gently because it is difficult to recover the situation if your dough is excessively moist. Place in an oiled bowl, cover with clingfilm and leave to rise at room temperature until doubled, about 1 ¼ hours. Place the dough onto a work surface dusted with pasta flour and cut into four pieces. The dough is exceptionally sticky like bubblegum, so I avoid contact altogether and mould each piece into a cylinder using a knife and tablespoon for shaping. Stretch each piece into a rectangle about 25 x 10 cm. If the dough shrinks back too much, leave it to rest for five minutes. Cut four pieces of baking parchment, allowing plenty of room for the dough to spread during proving. Put each loaf on the parchment (I now oil the parchment because the cooked loaves do tend to stick otherwise), seam side down and cover with lightly oiled cling film. Leave to prove until noticeably aerated, about 1¼ – 1½ hours. Thirty minutes before baking, heat the oven to its hottest setting. Put a wide heatproof tray or dish on the lower shelf. When the loaves have finished proving, remove the cling film from two loaves, slide them onto a hot baking stone (if you have one) or make do with a baking tray, complete with the parchment. Immediately fill the tray on the lower shelf with boiling water to make steam for a crispy crust and close the oven door as quickly as possible. Three times during the first ten minutes, open the door slightly and spray water into the oven to make extra steam. After ten minutes, turn the loaves round, reduce the temperature to 220° C, and bake for a further ten minutes. The loaves should be a deep golden-brown and sound hollow when tapped on the bottom when baked. Allow to cool completely on a rack before cutting. When you remove the first two ciabattas, don’t forget to put the oven back on to its highest setting for five minutes before baking the other two. Do use really fresh yeast — if you try and use something that has been knocking around your cupboard for a couple of years your efforts are likely to be wasted. Do know your oven. I have put the standard temperatures above but in my case I actually reduce by about 10% as my oven is so ferocious. Don’t put any implement or mixing bowl anywhere near your dishwasher – ciabatta dough hardens to something approaching candlewax in a dishwasher and does not vanish! Don’t forget that homemade bread has no preservatives and will not taste fresh for long. But these loaves do freeze very well if you can’t eat them all at once.